This article is reprinted with permission from The Ergonomics Report™ Archives, where it originally appeared on January 1, 2004. New year, new resolutions. It’s tradition. We dust off the treadmill, join the gym, vow to replace the bad habits with good, put our own health-directed goals at the forefront. But no one who pedals a stationary bike or stubs out that final cigarette does so with the belief that he or she is improving ergonomics. It’s merely an improvement in health that they’re seeking. So why, when implemented in the workplace, do resolutions that encourage workers to partake in on-the-job exercise programs, install and use stretch-break reminder software at their computer workstations, or commit to a personal wellness plan, so often get confused with ergonomics? Ergonomics, by definition, should strive to fit the work to the worker, not vice versa, which could mean anything from improving the worker-task relationship, the worker-tool relationship or how the worker fits into the overall operation. In each of these instances, the worker is key, and when a system isn’t working to its full capacity, possibly due to poor design that results in productivity issues or injuries, some aspect has to change – either the worker or the system. Following the tenets of ergonomics, it’s the system that should change. Simply put, humans cannot be redesigned to accommodate a poorly constructed system. But a flawed system CAN be modified to accommodate and work effectively with human capabilities. Take workplace stretching, for example. 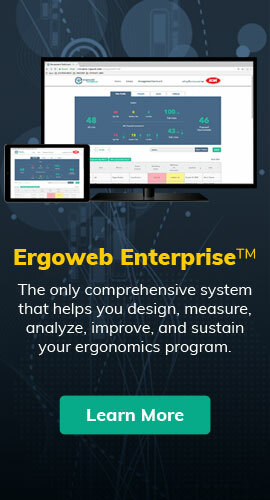 Whether it has a value or not when combined with ergonomics measures intent on improving a system has yet to be proven by science, but when used alone as “ergonomics,” a program that requires the worker to modify himself or herself in order to fit the flawed system simply cannot work. Yet it happens in business everyday. “Whatever stretching is, it is clearly not a substitute for ergonomic analysis and intervention. Our experience in the workplace suggests it risks becoming such a substitute. When workers say ‘I do my ergonomics every morning,’ we need to pay attention to better education and more care in implementing stretching programs,” wrote Jennifer Hess, DC, MPH, in a 2002 statement to Ergoweb Inc. Hess, who has studied and compiled research on the injury prevention effectiveness of stretching, agrees that it is an “important part of injury rehabilitation,” but as injury prevention, she indicates that there are still a number of issues that need to be addressed. “There’s very little that demonstrates the efficacy of stretching,” says Hess. “But people are honing in on stretching; it’s fast and easy.” Hess has even seen a group of maintenance workers at the University of Oregon campus where she’s employed participate in a stretching program. The resulting flexibility changes, she reports, were marginal. A paper published in 2002 by Rob D. Herbert and Michael Gabriel, titled “Effects of Stretching Before and After Exercise On Muscle Soreness and Risk of Injury: A Systematic Review,” sought to find out if stretching had an impact on the injury risk for athletes. The results of the review indicated that “stretching produced small and statistically non-significant reductions in muscle soreness” and in the two studies that looked specifically at risk of injury after stretching for military recruits, pre-workout stretching also had no apparent impact on the risk of injury, although the reviewers noted that more research was needed. “They’re looking for a reduction of MSDs, but [the research] hasn’t been able to show that,” Hess told The Ergonomics Report. “Employers are looking for ways to cut costs associated with injuries, and stretching still seems [to some employers] to be a quick and dirty means of doing that.” As for overall wellness, Hess also admits she likes the concept, but she’s not sure that it can truly impact ergonomics. John Craigo, MPT, Ergonomics Program Coordinator at Jackson Laboratory in Bar Harbor, Maine, is conducting his own research into a workplace exercise program, incorporating it into a workplace where not much can be done to change the system. “MSDs are the biggest work-related injuries we get,” Craigo told The Ergonomics Report. Craigo, however, faces the problem of not being able to modify the system. Workers in the lab move live mice individually from location to location. “No one’s invented something that magically transfers the mouse,” says Craigo. “I saw the same injuries time and time again,” says Craigo, who thought that if his workers were just a little stronger, they might not be at quite the same risk of these injuries. Tacking the exercise program onto another research program, Craigo set out to see if his theory might have some validity. The volunteer participants take 30 minutes out of their workday three days a week to exercise with a combination of free weight exercises (10 minutes) that target rotator, mid-back and overall upper extremity strength; 10 minutes on either a treadmill, elliptical machine or stationary bike; and another 10 minutes on a rowing machine. While Craigo doesn’t expect to have data to determine the program’s effectiveness for a few more months, anecdotal results have included claims of dropping three pants sizes; plus, he says, overall the employees have enjoyed the nine month old program. What Craigo hasn’t been able to conclude is if there has been an impact on the incidence of MSDs. In ergonomics, the first step is to change the system. But even in changing the system, the human side has to be considered. Concepts that focus on teaching the worker, like training programs, are integral to a system’s success, provided they aren’t attempting to make a worker perform a task that seems confusing or unnatural. However, interventions that strictly focus on changing the worker, rather than changing the workplace, are almost guaranteed, from an ergonomics perspective, to fail. But that doesn’t mean there’s no value to resolutions that incorporate workplace exercise, stretching or wellness-type programs. It just means as the first line of defense against injury or the first line of offense in improving work performance or productivity, none of these human-focused plans can take the place of true ergonomics resolutions – ones that engineer out the fallible and sometimes fragile nature of humans.